Greece Style is one of the few books from Taschen's Icon series that I haven't yet bought for myself. But there's a room in it (shown top) that I've loved for years. 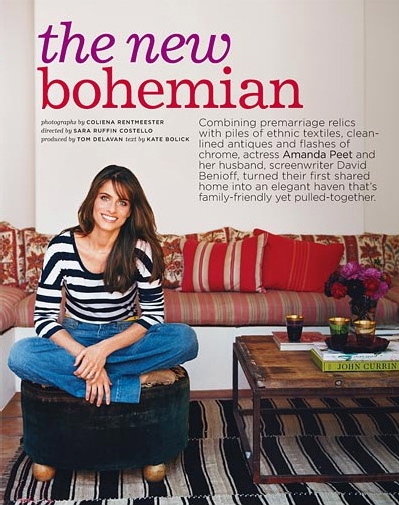 As soon as I saw Amanda Peet's home on Domino online (a neighbor must have nabbed my December copy), I thought about the pillow-laden banquette in Greece. At the moment we label the look "Bohemian-Chic" or "Globe-Trotter-Chic." Still, I don't find it trendy. Indian (or Indian-inspired) textiles, stripes, red-and-white, unpretentious banquettes -- all these elements have been around for centuries. And I love them. I'm not in Palm Springs, but one of my favorite local talents recently was. Generously, she has shared with me her design-related pictures snapped for inspiration (more on that next week.) 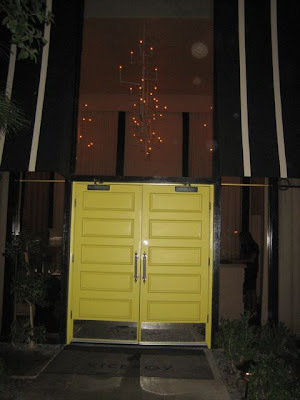 This one of the brilliant yellow doors at Viceroy Palm Springs reminds me of an Atlanta home I've long admired. It's flannel-gray brick and used to have a fabulous yellow front door. 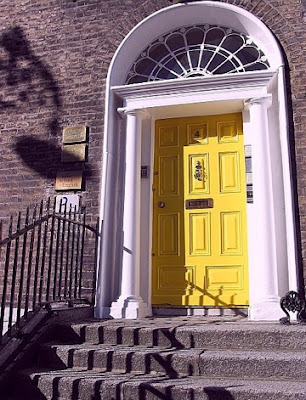 Not too many houses can pull-off the yellow door -- at least few homes in the U.S. seem to have them. But Dublin knows how to do it. Here's a great image via Mari. Fans of the designing duo Paul and Chris Briger will be happy to know the team's site has launched. 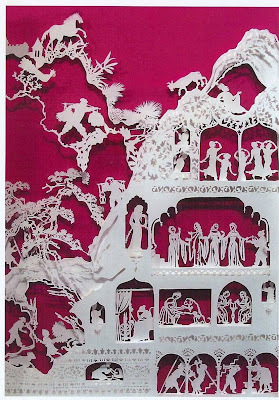 Dorothy Draper enthusiasts may remember the couple's homage to the legendary decorator last holiday season at Bergdorf Goodman. Speaking of legends, the general edition of Tony Duquette is scheduled to be released December 1. So I plan to be at the book store bright and early Saturday to get my copy. Photography © Michel Zabé, Rizzoli New York, 2007, as seen in Briger + Briger: Comfortable and Joyous Homes, City, Country and Lakeside. Here's some holiday red for you traditionalists. Brilliant Asylum introduced me to this handmade Nepalese wrapping paper. It is wonderfully thick, and so graphic like Madeline Weinrib's zig-zag rugs. I'll be trying different ribbons with it. 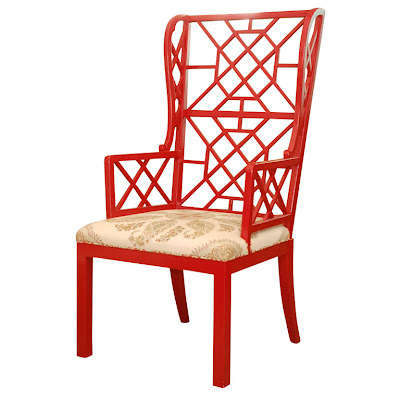 I've posted Chapman Radcliff's Kelly wing chair before (in white) and I think the red has appeared already in some shelter magazines, but I just love how these latest images show off the paisley upholstery and bold Chippendale-style fretwork frame. 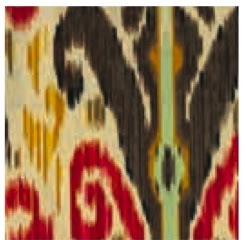 A reader is searching for one and a half yards of Lee Jofa's discontinued "Pardah Print," in sable/flame. (Currently featured on page 22 of the December House & Garden.) If she can't hunt down a remnant, she is open to alternate suggestions. I'm partial to Robert Kime's ikats, but the reader hasn't quite found the perfect thing there. Thoughts? Another look at the holiday displays at Providence Antiques in Atlanta. Thanks Janet for reminding me to type "Kashmir" in the Victoria & Albert search box. 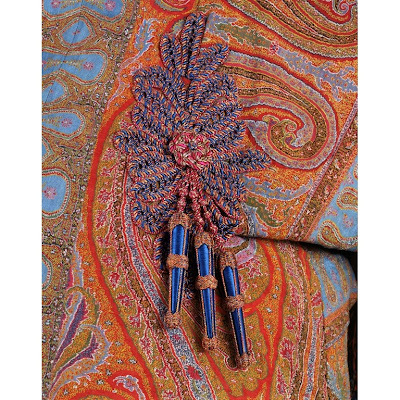 Some amazing Indian textiles and objects are included in the Museum's collection. Don't the oranges, aquas, greens and purples look so fresh? 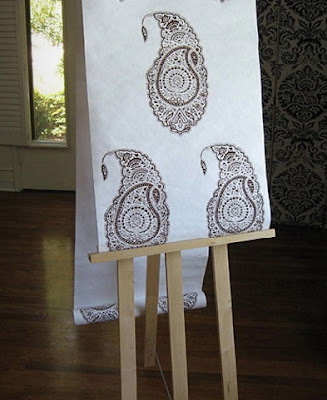 Like the inspiration behind something new from Lee Jofa. Two of my favorite lavishly illustrated books would make great gifts for a decorative arts fan: The Majesty of Mughal Decoration and Bright Flowers: Textiles And Ceramics Of Central Asia. I think I've already mentioned Bright Flowers about five times. But it really is a definitive source. In the volume suzanis (suzan is Farsi for needle and today the term suzani is generically used to describe embroidered textiles of Central Asia) are covered extensively. Traditions of ancient Bukhara are explored along with contemporary craft and commerce. Neither book is for the person who mainly wants to see interiors. However, anyone who is into details will I think appreciate them. Suzani detail above, silk chain stitch on cotton, is from the Bukhara State Art and Architectural Museum, as seen in Bright Flowers. For those of us who love the hunt, it looks like an interesting new book about vintage shopping is on the horizon. 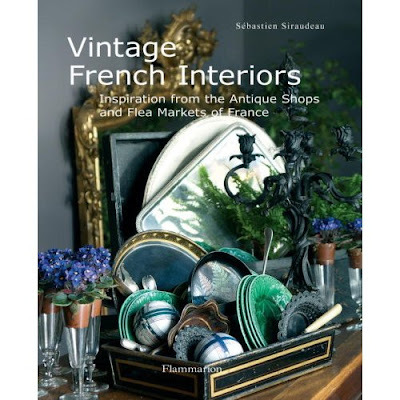 Vintage French Interiors: Inspiration from the Antique Shops and Flea Markets of France is scheduled to be released March 2008. I've been told Paris is covered exhaustively along with France as a whole. I'll share images as soon as I can. Speaking of books, oh how I wish I could be in L.A. in December. At Hollyhock, Suzanne Rheinstein will host a book party to celebrate Tony Duquette. Authors Wendy Goodman and Hutton Wilkinson will be there for signing. 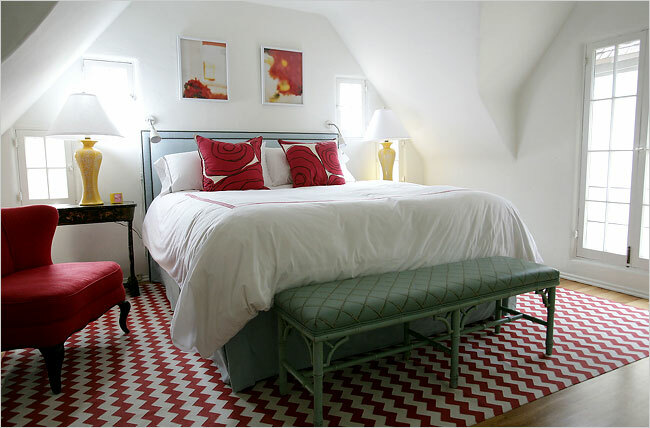 Did you know Hollyhock is in the building that once housed design legend Duquette's studio? 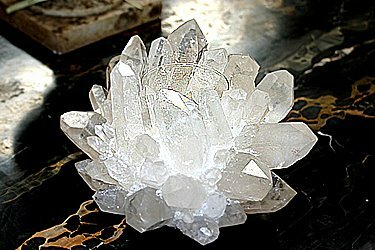 Last year I mentioned this rock crystal votive, one of Hollyhock's most popular items. Apparently, Duquette loved these. More products may be viewed now at Suzani Interior's revamped site, and online shopping is available but orders must be placed via email as the shopping cart mechanism isn't fully operational yet. One of my favorite related books: Flowers of Silk & Gold: Four Centuries of Ottoman Embroidery. 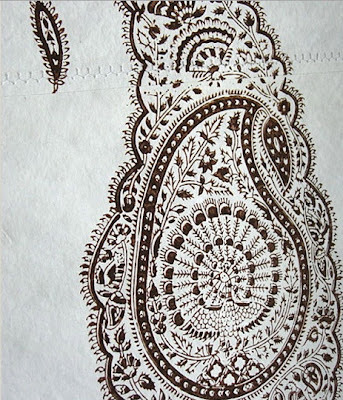 A reader asked about Les Indiennes papers. The company's founder, Mary Mulcahy, says her Indian-inspired, handmade cotton paper rolls are 20" wide by 10' long. She thinks of them as art pieces. Mulcahy plans to soon launch a wallpaper line as well. 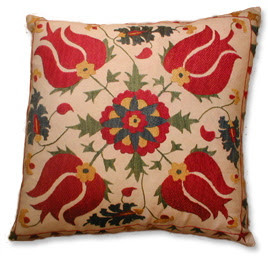 Look for Les Indiennes' online shop to be up and running after Thanksgiving. This image makes the cut for my iPhone. 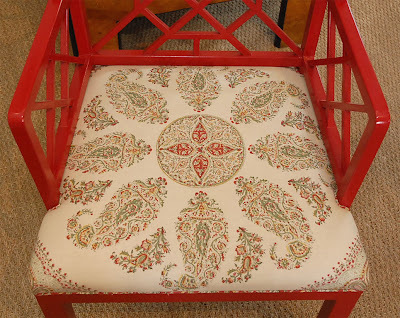 "Tashkent," a suzani-inspired fabric by Robert Kime, is a favorite of mine and I love how mix-master Betsy Burnham used it on this entrance hall chair. Overall the look is a bit tame for Burnham, but I think it's so chic. For more pick up a copy of the December House Beautiful. The bone mirror is from Blackman Cruz and the chest is available through Mecox Gardens. Photo by Grey Crawford. Click on the Burnham label below to learn more about this talented West Coast designer. I just heard from Mary Mulcahy, founder of Les Indiennes. 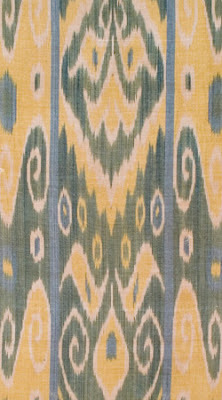 If all goes well, her lovely Indian-inspired textiles and linens will be available for purchase online by next weekend. Image from Vogue Living: Houses, Gardens, People, published by Knopf, 2007. The other day we had a little conversation about mixing painted furniture. Excluding neutrals such as black, white or cream, how many colors can be combined in one room? Jennifer has helpful suggestions. She feels that it is possible to successfully do a few different colorful painted pieces in a room, but she thinks that only one item (or one set of something) should be bold in color, size or shape. After settling on the focal point, Jennifer advises mixing in a small, antique painted piece that is rather faded. "That way you don't have multiple pieces competing for dominance," she says. 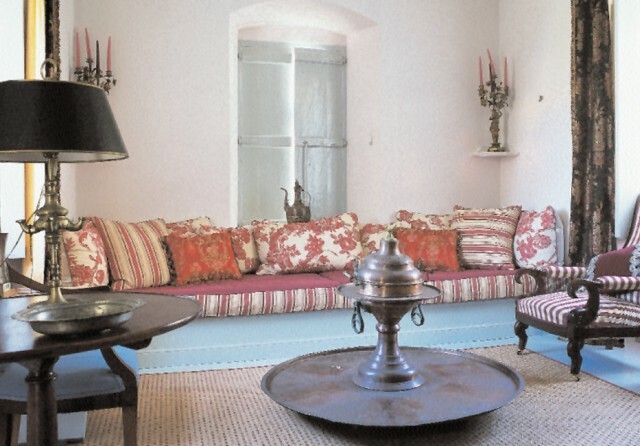 I love how in the vignette above Janet de Botton used a glossy red table with subtler neutral painted pieces. Since I started reading John Fowler: Prince of Decorators, I've become obsessed with stately old British homes. (Fowler decorated so many.) Sezincote, above, is a sublimely eccentric example. Built around 1805 as a Moghul folly, exotic Indian-influenced Sezincote served as inspiration for the now more famous Brighton Pavilion. These days the house may be rented for parties and weddings; I'd love to see Mary McDonald put together an event there. 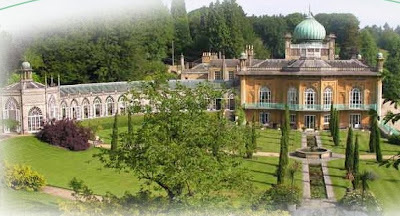 BTW: For more on Sezincote's architecture, gardens and interesting mix of global styles, be sure to visit its official site. Images from John Fowler: Prince of Decorators, published by Frances Lincoln, 2007. Shown top is Britain's Claydon House; below, Sudbury Hall. I adore the color combinations John Fowler chose for his National Trust restoration projects. But everyone hasn't always been so enthused. When houses are centuries old, they have often been modified quite a bit by various owners. Decorators and restoration committees of the 1950s didn't have today's technology available to them and tended to disagree on which look to go with. Fowler actually decorated Claydon House twice -- in the 50s and 70s. Image above, Claydon House, copyright Britain's National Trust. 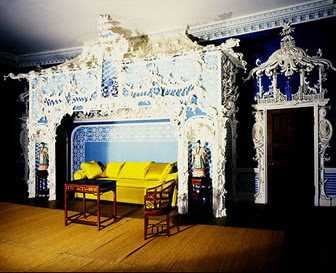 On the second go-round he painted the Chinese Room at Claydon House (the most intricate chinoiserie room surviving in Britain) a lush, deep blue. To use HGTV-speak, I think his choice makes Luke Lightfoot's elaborate 1769 white woodwork just pop. Fowler juxtaposed the blue with imperial yellow silk curtains. Time has proven that the legendary decorator's vibrant colors are rather spot-on for the 18th-century. 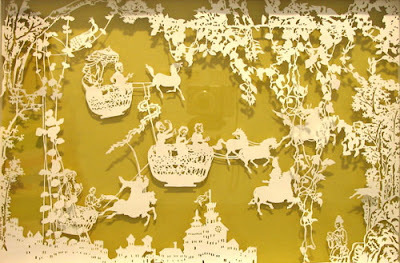 I couldn't resist pairing the contemporary, chinoiserie-inspired, cut-paper work of Melbourne artist, Emma van Leest, above, with that of Lightfoot and Fowler. Krista Ewart's bedroom photographed by Stephanie Diani for The New York Times. Brilliant Asylum's discovery of handmade Nepalese wrapping paper is seriously tempting me to rethink my holiday plans. 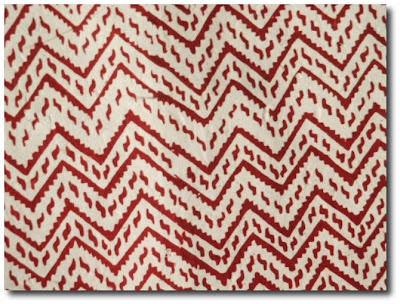 I love the Brilliant comparison to Madeline Weinrib's zig zag rug. 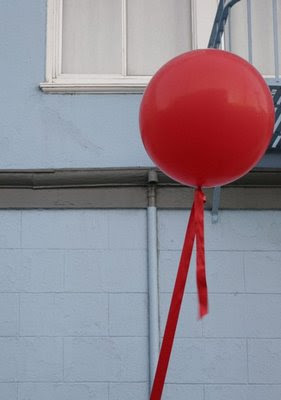 My other favorite find this week is Megan Samuels' three-foot balloon from Flood Street Curiosity. 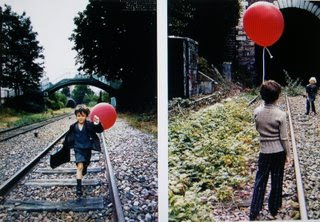 As Megan says, it's straight out of Le Ballon Rouge.